Blog A Role Model and an Inspiration! A Role Model and an Inspiration! Before Ariel Puent was born, she developed a rare condition in the womb. This condition is called Amniotic Band Syndrome, and it cut off blood flow to her arm. 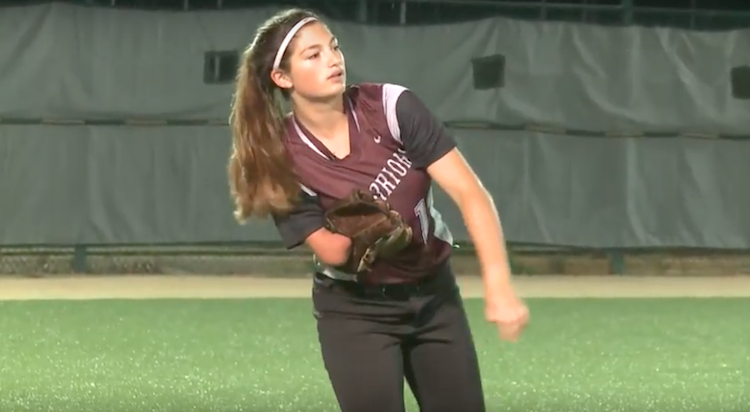 She was born with an abbreviated arm, ending just where you would expect to see an elbow. However, Ariel says, “I wasn’t born with a disability, but rather a gift.” As a freshmen, she was the starting left fielder for her varsity high school softball team, St. Charles West High School in Missouri. Joe’s Perspective #1 – Lift People Up, Don’t Bully Them: Can you believe this girl was bullied and picked on? Really? A person who has overcome so much. A person who works this hard? A person who is looked up to as a role model and an inspiration? She currently has over 4.5 million views of her video on Facebook. And yet, when she was growing up, kids from her own school mocked her. This is such an odd world. We (society) can be so much better. Don’t put someone down who is different from you or who is struggling. Please choose to lift them up and help them feel accepted. Joe’s Perspective #2 – Work Hard for Your Success: If Ariel can overcome her difficulties, so can you and you and you and you. Please understand that life is difficult for everyone. We all have to struggle and work and dig in. There are no shortcuts. There are no overnight successes. Those who work harder, generally speaking, are the most successful. Be willing to fight just as hard as Ariel for your successes. Your Turn: After watching this video and reading this post, what do you take away from Ariel’s story? something that I take away is that if you are different in some way wheather it’s having a disability or whatever the case is, you should be proud of it, not ashamed. like Ariel said, she thinks of her disability as a gift and that’s the way I think everyone should think of it rather than a set back. This goes to show the value of perspective. If Arial thought this disability was a setback, she most likely would not have been this good at what she does. everyone is different, and you should accept everyone no matter their diabilities. I take away the fact that no matter your abilities or disabilities you can be great at anything, as long as you put your mind to it and not let anyone or anything stop you from reaching your goal. What I like is how she accepted herself first and didn’t let her disability be a setback. She seems comfortable with her armand that is important before you can do anything else. I believe this goes to show that if you truly believe in yourself and don’t let others phase you you can do what you set out to do. I also believe Thais is an example of perseverance. What I take away after this activity is that if you believe in yourself and don’t let others phase you, you can do what you set out to do. This shows if you are able to accept adversity and be able to overcome that and persevere you will succeed. What I take away from this story is that we all are not perfect, and we need to find ways to use our imperfections and disabilities to our advantage. As she says, her disability is not that to her, but rather a gift. What I can take from Ariel’s story is even when things are hard or difficult keep working and set it as a goal to work towards and soon complete. If you are different that definitely doesn’t limit you from anything. What I take away from Ariel’s story is inspiration to work harder. If Ariel can overcome so much and work to achieve her goal, I know I can too. I also love that she views her arm as a gift which helps her to achieve her goals.